Gunjo Gakuen (Deep Blue School) is a facility designed to gather and isolate those students who got a high score on an adaptation exam (scoring high on this exam indicates that the student is less likely to be able to adapt to society) mandated by the government. 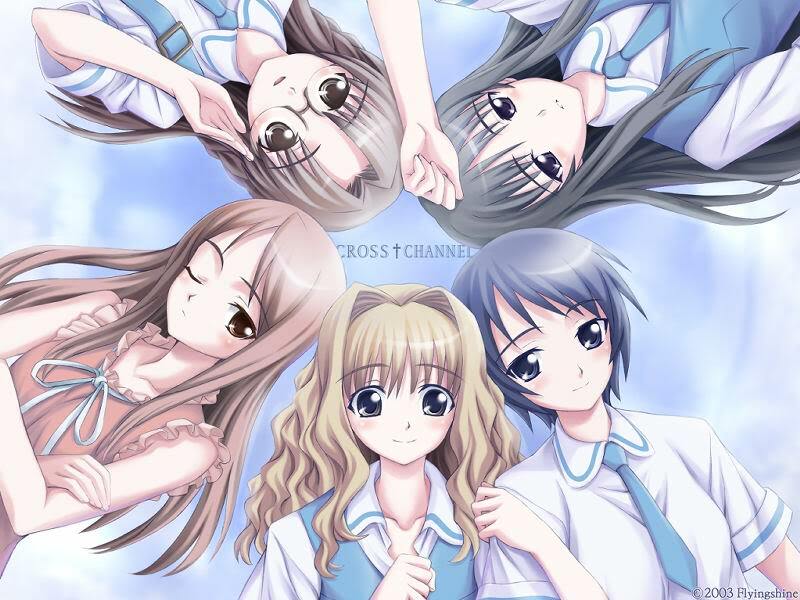 Cross Channel consists of a single ending and therefore there will be no replaying the game to get every single path. Instead the game repeats itself as you're progressing and you get to experience each heroine individually and then reach a true ending after all of their "routes" are done. You will start off the game in what is known as "week one" where only one route is available. Making wrong choices will not give you a bad ending, it will merely make you repeat that week again and you may change your choices to attempt and get the heroine you want, hence why i will be omitting the Bad End section from this walkthrough. Regarding a suggested route order there isn't one as the game has a forced playing order to unlock each path. 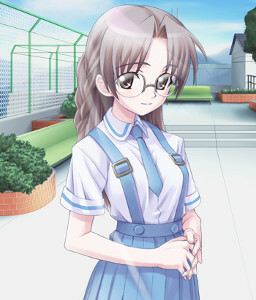 Character description: A girl with glasses and large breasts. She is the president of the broadcasting club. Her exam score is never revealed, but Taichi does note her engaging in severe self-destructive behavior from time to time, which would put her at least above 30. She refers to Taichi as "Peke-kun". 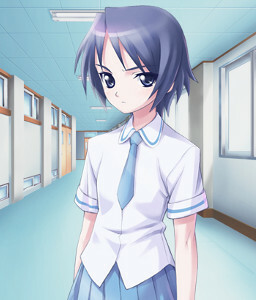 She has a problem with Tomoki, the brother she has been separated from since the divorce of their parents. Character description: A girl descended from a samurai clan. She used to go out with Taichi, but currently is very harsh to him. "Kirihara" is an anagram of Harakiri, which Taichi sometimes uses as her nickname. She scored 44% on the exam, and as Taichi says at one point, is "desperately trying to hold on to the last 56% of her humanity as best she can." 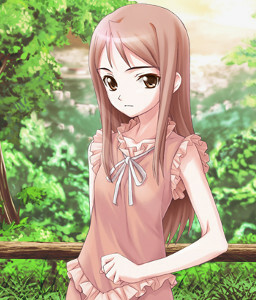 Character description: A squeamish girl who hates and fears Taichi. She is a good friend of Miki. Kiri and Miki are nicknamed "the flowers" by Taichi, because they seem to be "two flowers from the same pot." 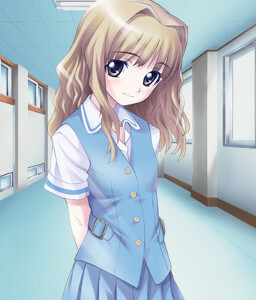 Character description: A girl with cheerful character and humble breasts. Taichi jokes about her being his pupil in perversion. Is sometimes cruel but is funloving. Character Description: A kunoichi (female ninja). She's always monitoring Taichi. She is very devoted to Taichi, sometimes to the point of stalking him, but he for the most part ignores her. 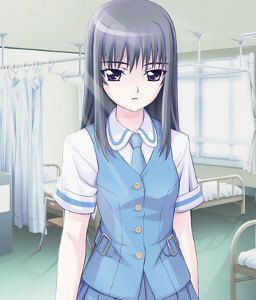 She used to be Taichi's first love, and is admired by Taichi for being an almost complete person in his mind. Description: After completing Youko's route, and thus all major routes, you will begin "week six." This time, the first choice you make regarding where to go selects which mini-route you will follow. There are six mini-routes, and all of them must be completed. The order you do it in is largely irrelevant, although Kiri's must precede Miki's, and Youko's must come last. There are no choices to be made during week seven, all you have to do is read through it and enjoy the ending of the novel. 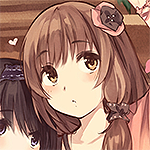 Regarding CG collection: Following this walkthrough should award you 100% of all the CGs as the game forces you to play through every path and thus it's unlikely you will miss one.